This sailing experience on a motor yacht is perfect at any time of year. Book our motor yacht experience with friends or family and create memories that will last a lifetime. 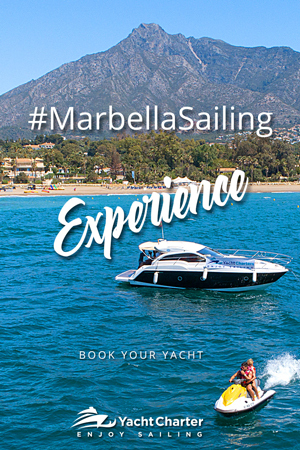 Enjoy a boat trip around Marbella, add exhilarating watersports activities and make it an action-packed day or opt for live music with a DJ or a saxophonist for a romantic and relaxing trip. Sailor and assistant on board. Book a Marbella Boat Party for you and your friends, we include a DJ or a live music saxophonist, floating raft parties and watersports activities. The perfect sailing experience to enjoy with your friends or family at any time of year onboard a luxury sailing boat. Charter a sailing boat with YachtCharter.Rentals today and make it an experience to remember. Rent your own sailing yacht for 2 hours or a day, with up to 10 of your friends including a Yacht Charter Rental skipper. Screw the crew, go as two! Book a Yacht for 2 on our luxuries yachts with other guests. Includes skipper and complementary soft drinks. 4 hours | Mooring Puerto Banús. Visiting Marbella Coast: Puente Romano, Nikki Beach, as far as Marbella Port, and coming back to Puerto Banús Port to finish our sailing experience. Charter a motor yacht in Marbella with your friends or family and and enjoy two hours of the best sailing experience on the Costa del Sol. Yacht charter services based in UK and Spain. At Yachtcharters rentals we offer excellent service to all our customers. In the yachting world, there are no other company that is qualified and trustworthy like us.